The HIV Cure Research with the Community workshop kicked off discussions about HIV cure in Amsterdam. Chaired by Sharon Lewin, Steve Deeks and Fred Verdult, the program included a variety of presentations, discussions and debates about cure. Michael Louella of defeatHIV led a great interactive session on building a yellow brick road towards a cure – video here. As an interlude, the charismatic Moses Supercharger led a sing along for why an HIV cure is a priority! You can see the video, along with pictures from the workshop on our Facebook page. 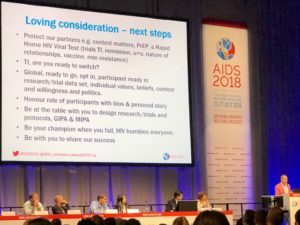 Cipri Martinez was part of a panel discussion on what’s new in the clinic and Sharon Lewin participated in a debate on ‘What should we do to HIV latency: “shock and kill” or “block and lock”?’. 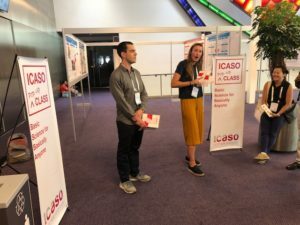 On Monday, Dutch researchers hosted a cure-focused research workshop ‘Novel Insights from HIV-1 Pathogenesis: Links to Cure and Vaccine Strategies’. Doherty Institute researcher, Dr Amy Chung highlighted presentations by Professor Stephen Kent on ways that antibodies can block HIV spread and Dr Jori Symons on latency reversing agents. We hope to get some more updates from the workshop in coming days. 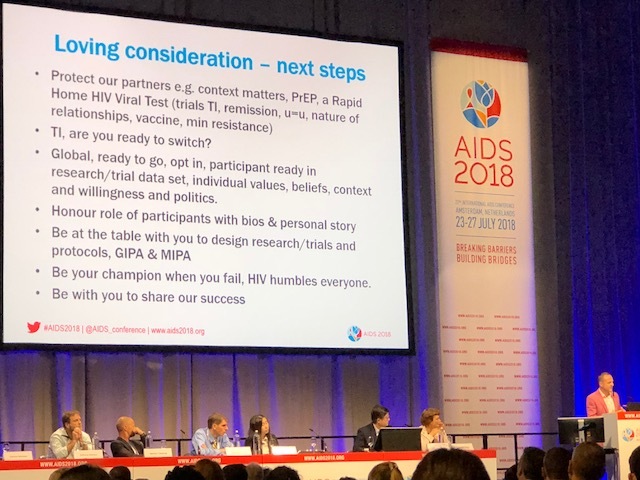 Brad Jones delivered a powerful plenary presentation illustrating the challenge of the HIV reservoir and some strategies to eliminate it. His presentation can be viewed here (his talk starts at 11:35), and his slides can be downloaded here. Jones outlined that either draining the reservoir (eliminating HIV+ cells) or boosting immunity could prevent HIV rebound if treatment stops. Possibly both will be needed. He neatly described current strategies and challenges for measuring the reservoir. Challenges include anatomic sanctuaries, the dynamic nature of the reservoir and emerging evidence for a survival advantage of HIV-infected cells. He then outlined cure strategies such as ‘kick and kill’ and broadly neutralising antibodies. The second part of the presentation focussed on HIV vaccines, and in particular the engineering of antigens to develop broadly neutralising antibodies and the recent study from Dan Barouch and Juliana McElrath detailing the parallel success of an adenovirus-vectored HIV vaccine tested in monkeys and humans (more details here). The results of two much-anticipated HIV cure-related clinical trials have been presented. These results provide a sobering reminder of the difficulty in finding a cure for HIV. RIVER is a really important study in the field because it is the largest study of a cure intervention related to kick and kill. It was randomised and it was also done in people who started treatment early, within 6 months of infection, and in those individuals, we know that the reservoir is smaller and immune function tends to be better. These results are disappointing, but not necessarily the end of the ‘kick and kill’ strategy. Vorinostat is considered a first generation latency reversing agent. There are many more potent and specific agents now under investigation. In addition, the safety profile of both the vaccine and vorinostat in this trial are reassuring. More data has been presented on the alpha4beta7 antibody that impressively prevented viral rebound in monkeys in studies published in 2016 (read here for more details). The previous work showed that repeat dosing of an alpha4beta7 antibody (both on and off ART) prevented viral rebound in monkeys. 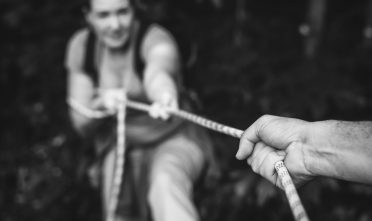 Two follow-up studies have been presented this week, and unfortunately neither reflects the earlier promise of this approach. A repeat monkey study presented by Michele di Mascio failed to show any difference in viral rebound between animals given the alpha4beta7 antibody and controls. An exploratory human study presented by Tony Fauci also failed to induce any viral control. In this study, 18 volunteers with well-controlled and treated HIV infection were given vedolizumab. Vedolizumab is a human alpha4beta7 antibody already licenced for treating severe gut disease. The volunteers then stopped treatment, but showed no sign of durable viral control. There are differences between the three studies that need to be further explored, but for now alpha4beta7 doesn’t look like the next big thing in HIV cure. Conference goers may have been lucky enough to come across one of the pop-up science classes dotted around the conference. Three different themes are on offer: Epidemiology for Everyone, The Science Behind U=U and Basic Science for Basically Anyone. Jared Stern and Paula Cevaal are the presenters for Basic Science which concepts including latency, HIV cure strategies, flow cytometry, and analytical treatment interruptions in a brief and fun format. Read more about Jared’s experience here. Cipri Martinez gave a presentation titled ‘Understanding Community Participation in cure studies: what scientists need to know’ during a symposium on eliminating HIV. 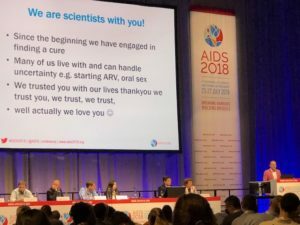 The AIDS2018 Facebook page is chockers with great material, including a discussion on HIV cure with Sharon Lewin and Steve Deeks, Anthony Fauci discussing HIV vaccines and a discussion of HIV stigma with Charlize Theron and Conchita. Finding solutions to prevent, treat and cure infectious diseases and understanding the complexities of microbes and the immune system requires innovative approaches and concentrated effort. This is why The University of Melbourne – a world leader in education, teaching and research excellence – and The Royal Melbourne Hospital – an internationally renowned institution providing outstanding care, research and learning – have partnered to create the Peter Doherty Institute for Infection and Immunity (Doherty Institute); a centre of excellence where leading scientists and clinicians collaborate to improve human health globally. HIV can infect a cell, remain ‘intact’, and replicate but sometimes the virus becomes defective and can’t do so. Intact viruses are the main problem if people stop treatment because they can reactivate. Telling ‘intact’ HIV apart from ‘defective’ HIV is difficult. Pinzone et al. looked in detail at intact and defective viruses in four HIV+ people over time. Their results suggest that cells with intact virus are more likely to die than those with defective virus. This could be important for targeting the latent reservoir. The implications are still unclear from this small but intriguing study. What should a functional cure for HIV aim to do? Supported by the National Institute Of Allergy And Infectious Diseases of the National Institutes of Health under Award Number U19AI096109. The content is solely the responsibility of the authors and does not necessarily represent the official views of the National Institutes of Health. Founded in 1989, The National Association of People with HIV Australia (NAPWHA) is Australia’s peak non-government organisation representing community-based groups of people living with HIV (PLHIV).